The novel opens with two teenagers traipsing through the snow covered countryside in the middle of the night after coming home from a party but instead of going home they find themselves near the house of Magnus Tait, a strange and lonely man. One of the girls dares the other to knock on the old man’s door and so the girls find themselves inside the house and sharing a bit of drink to welcome the New Year. A few days later the body of Catherine Ross will be discovered in the snow. If it hadn’t been for the red scarf and the ravens pecking around her Fran Hunter, a local artist, would have missed the body. The police and locals think this is an open and shut case after all Magnus Tait had been accused of the unsolved murder of a child several years back, but Inspector Jimmy Perez doesn’t think the case is all that simple. Inspector Perez begins to look for clues by questioning Catherine’s only friend, Sally Henry, daughter of a village school teacher. Sally had been a bit miserable with her life, not pretty enough or thin enough but with Catherine she had found somewhat of a friend. Still as Sally tells Perez about her he realizes Catherine could be cold and calculating. So there was plenty of motive but who could have killed her? There are lots of clues in this novel and I had to keep guessing but I think the writer does a wonderful job of fleshing out all the characters and making the reader wonder about their motives. There is Fran who not only found Catherine’s body but later on makes another grisly discovery, Fran’s ex-husband who is a bit of a Player and always has lavish parties and the list goes on. Perhaps the one thing that I realized at the end of the book is that Inspector Jimmy Perez is the least noticeable of characters. He is competent and likable but it almost seems like he isn’t in control of the scene. It is the other characters who are leading the reader up to the big reveal. I need to read this book this year. I’ve been meaning to start this series for such a long time. Wonder if the fact that Jimmy seems to have an almost minor part in solving the crime is due to this being the first book in the series? Have you read the next? I think the author originally was going to have it be a quartet and then I’ve noticed at least one new book and maybe more featuring the characters. Thanks for reminding me about it! I so rarely re-read books. I have never read this one. It’s interesting that the protagonist takes more of a back seat to solving the crime in this one. I’ve noticed that in other mysteries too, although not too often. I read this in 2008 and had planned to continue the series, but somehow I never did. 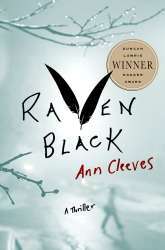 Thanks for reminding me–now I can Cleeves to my library list! Hi Iliana, this sounds like a well written story that keeps you guessing 🙂 Glad you enjoyed the re-read. On a different note, I’m back to blogging, slowly but surely. Melody – I know right? I didn’t read my review until after the re-read and it was funny that I kind of felt the same way. I wouldn’t have re-read it if it wasn’t for book club but I didn’t remember too much and didn’t want to be left out! Kay – I have. I read the second book in the series and I did enjoy it. I keep meaning to read another but you know how that goes. Now I’m curious though if she’s expanded the series! Literary Feline – I can probably count the books I’ve re-read too. There are so many I love and think it would be cool to revisit but then there are just so many more waiting for us right? I hope you do check this one out. Jenclair – I know, now that I’ve re-read this one I want to find out what else happens in the series. I don’t re-read books often either, but it’s kind of fun when there’s a good reason like a book club.